As if the spotlight could shine any brighter on Zion Williamson, now the Duke freshman will open play in the NCAA Tournament in his home state. Duke, the overall No. 1 seed for the tournament, starts its quest for a national championship Friday night against North Dakota State at Colonial Life Arena in Columbia, S.C. So it's like a homecoming for Williamson. "Just trying to win a national championship and playing in all these tough games because that is why you come to Duke, to compete and hopefully hang a banner," Williamson said. He's from Spartanburg, S.C., so his action in Columbia will likely mark his only collegiate appearances in his home state. Duke didn't play this season at Clemson. 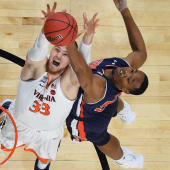 The return of Williamson, the ACC Player of the Year, has regenerated confidence for the Blue Devils, who were 3-3 in the six games before the conference tournament, plus one of the victories was a one-point home triumph against struggling Wake Forest. Duke ended up as the top seed for the East Region. "It's great," Williamson said. "It shows that all of our hard work is paying off, so let's dance." Duke forward RJ Barrett (22.9 points per game) and Williamson (22.1) are the top two scorers in the ACC. With Williamson's return, Barrett's role shouldn't be as taxing. "We have been very good as a team when everybody's together," Barrett said. "... It's March Madness. There will be a lot of crazy times and I just can't wait to be a part of it." Duke has won five national championships under Mike Krzyzewski, whose 94 NCAA Tournament victories are the most for any coach. The Blue Devils are a No. 1 regional seed for the 14th time, matching the second-most in the tournament's history. North Dakota State had to win against North Carolina Central in Wednesday night's First Four game in Dayton, Ohio, to set up the matchup with Duke. That 78-74 outcome involved a 13-point second-half lead dissolving into a five-point deficit before the Bison recovered. "We knew it wasn't going to be easy," North Dakota State coach Dave Richman said. "And they certainly didn't let it be easy for us, too. But extremely proud of our guys' resolve. It's March and we're excited to keep dancing." Duke has never faced North Dakota State. "We're excited it's Duke," Richman said. "We're excited to be playing, whoever it was. We've got to turn our guys around, enjoy this for a little bit and prepare for Friday night." North Dakota State guard Jared Samuelson said it's necessary to embrace the task. "We're ready for the challenge, ready to go compete," he said. Duke is 12-9 in games in Columbia, but it hasn't played there since the 1974-75 season. The Blue Devils are 3-1 in NCAA games in South Carolina, losing the most-recent outing to South Carolina in 2017's second round in Greenville. The North Dakota State-Duke winner plays again Sunday against the winner of Friday night's late game between Virginia Commonwealth and Central Florida.